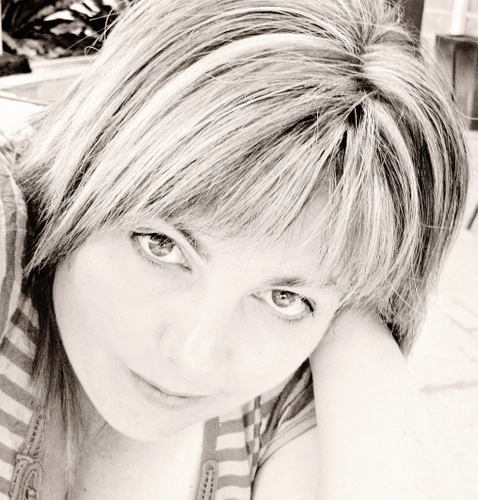 It is with great pleasure that we welcome Trudi Harrison as our guest designer for February. 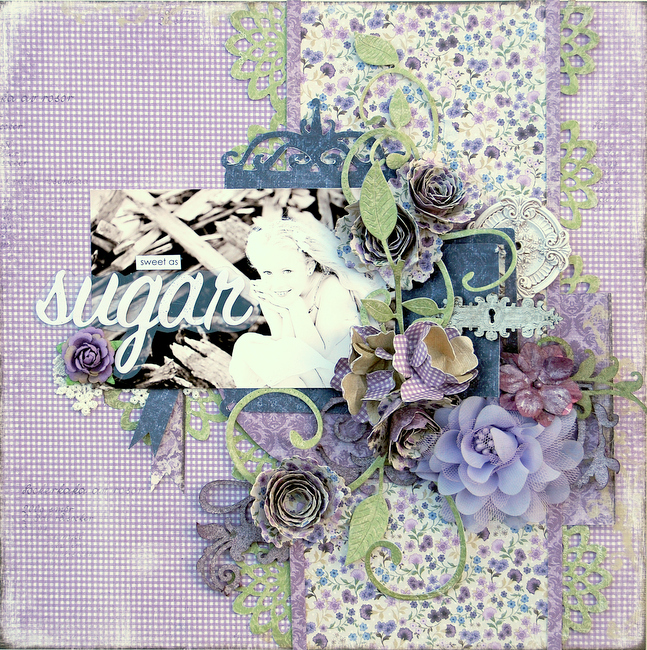 I'm sure many of you have seen and admired Trudi's work in the past, and I know you will be inspired by her layouts created using our February Kit. First, we'll let Trudi tell you a little bit about herself, then we will give you a look at her layouts. They are truly amazing! 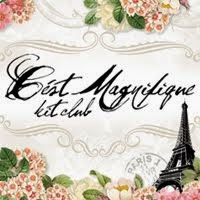 I sincerely thank Leslie for the opportunity of Guest Designing for C’est Magnifique Kits this month. A little about Me….. I am Trudi Harrison from Victoria, Australia. I am pretty much a 'country' girl at heart who very much likes her modern conveniences J. I live in a small country town an hour out from the city of Melbourne with my husband and 2 girls. Presently I am a SAHM majoring in 'domesticated engineering',. When I am not crafting, my world is kept busy with family and the extracurricular activities that comes with raising kids. I have done some form of ‘crafting’ my whole life and there have been many hobbies over the time which I have enjoyed. Without a doubt though, paper crafting is the one that I am truly passionate about. The passion has burned brightly since the birth of her first child in 2004. I would say that I am perhaps not 'locked' into a specific scrapping style. At times it can be a touch feminine and perhaps quite structured with lots of layering, paper cutting, dimension and detail. My work will often feature my children, so my inspiration will come from the little things that they will say and do. Inspiration will also come from the product or the photos that I am working with. I absolutely adore chipboard, floral patterns and blooms and find much enjoyment combining these with my other love of patterned paper. My preferred genre is 12 x 12 layouts but I will also find enjoyment in creating other projects - particularly altered and home decor items and cards. Presently I am on the Design Team for the Australian Manufacturer’s Twiddleybitz, Manor House Creations and Kaisercraft and for the Australian Scrapbook Ideas Magazine. I have previously designed for Prima Marketing and The ScrapCake. I took some inspiration from the chipboard dress form and rather than create something feminine and girly, I have gone for more of a 'steampunk' look for this one. The Maja Design papers work well for this style. Lots of die cut cogs from patterned papers were combined with the stunning chipboard dress form along with a few flowers. The flowers were 'grunged' up with color spray and glimmer mist, as was the Prima Amore Heart. Something girly and sweet, just like my girl is. Lavender and green is such a pretty combination. A splash of 'spice' was added with darker blue for contrast. A window effect was created with a decorative frame die cut. The rectangle insert removed was converted to create a little shutter attached to the side. Another piece from the Blue Fern Chipboard Frame sits along the bottom of the window edge. This was altered with the Color Shine Amethyst. Die Cut flourish vines and leaves were layered with some hand made and ready made flowers. Two different types of flowers were made - one with a Spellbinders Spiral Blossom One Die and the other with a Floriana Flower Punch - for this one I used 3 punched flowers to create the bloom. Thanks so much for joining us, Trudi. This isn't the last you'll see of her layouts. We will have more in the next couple of weeks, along with the rest of the design team. 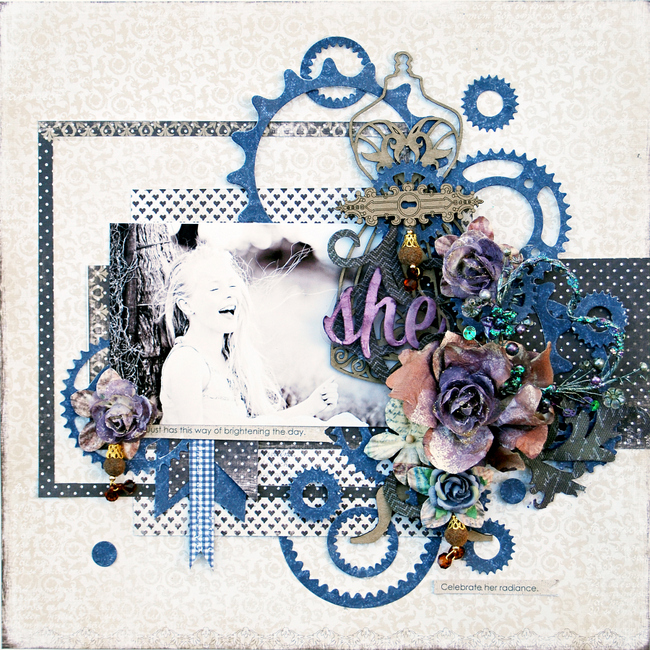 Love the cogs on a girly page, this looks great. SO happy to have you, Trudi~ I'm such a fan of your work!!! Welcome, Trudi!!! So glad to have you here - great layouts!!! Announcing our December Sketch Challenge Winner!